The Node Attributes are a set of variables attached to the node that affect the operations of the node. For example, the Ellipse node's attributes center and radius define the center and radius of the ellipse created by the node. This attribute represents a multiple choice variable. 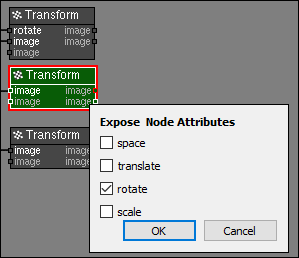 The Attributes Panel is the window that is docked in the Control Panel and displays the attributes of the node. The Attributes is a node that can hold custom attributes and convert them to node value.